Starbucks-branded K-Cups for Green Mountain's popular Keurig machines. The companies announced their partnership would continue. 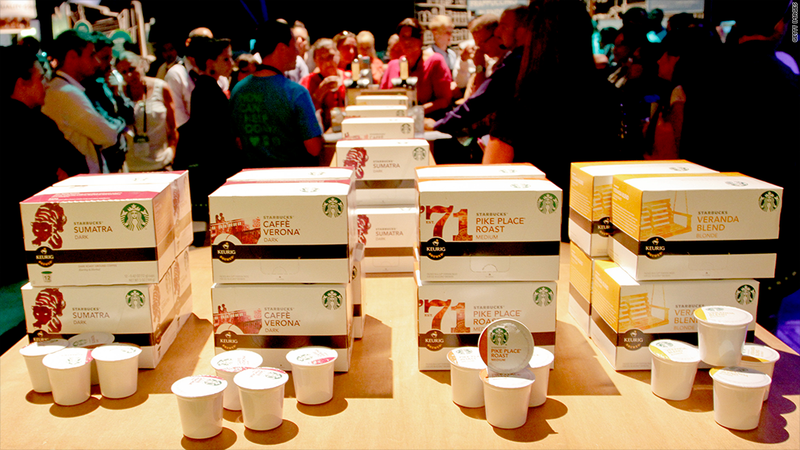 It's good news for people who love their Starbucks from a K-Cup. Green Mountain Coffee Roasters announced Wednesday that it will continue its partnership with Starbucks for at least another five years. The two companies have been partners since 2011, when they inked a deal for Starbucks and Tazo-branded single-serve packs to be made and sold for Keurig brewing machines. Shares for Vermont-based Green Mountain (GMCR) rose more than 10% after hours on the news. Financial terms of the expanded deal were not disclosed, but it puts an end to investor concerns that Starbucks (SBUX) would nix the partnership after introducing its own single serve machine, the Verismo, last year. Since the original deal, Starbucks has shipped more than 850 million of the Starbucks coffee K-Cup packs, according to a press release. As a part of the new contract, Starbucks will add new brands, including its Seattle's Best Coffee and Teavana teas, to the product lines. The companies also said they hope to expand global marketing of the products. "This agreement further strengthens our North American partnership with Starbucks and expands our relationship to explore global single-serve opportunities," Green Mountain President and CEO Brian P. Kelley said in the statement. Green Mountain also posted strong quarterly earnings after the bell Wednesday, beating analyst estimates. The company's single serve business, which includes Keurig brewers, accessories and single serve packs, grew by 16%, according to the company's release. Shares of Starbucks were up slightly after hours.